Head injuries are very common injuries and the cause of more than one half of all traumatic deaths. A great variety of injuries may affect the scalp, skull, and brain. Head injuries can be classified into 2 major categories of brain damage, primary and secondary damages. The primary damages are those that occur at the moment of the injury and include scalp lacerations, skull fractures, contusions and lacerations of the brain, diffuse axonal injury, and the intracranial hemorrhages. The secondary damages are those produced by complications arising from the primary damages and include the lesions produced by increased intracranial pressure, ischemia, brain swelling, and infection. An alternative method of classifying the pathology of head injury is into focal and diffuse injuries. Focal injuries are those which can be seen by the naked eye or by imaging studies; these injuries result from direct impact to the head (eg, scalp laceration and contusion, skull fracture, epidural hemorrhage, subdural hemorrhage, brain contusion). Diffuse injuries are those which cannot be fully appreciated by the naked eye, although some imaging techniques may provide evidence of these injuries; these injuries result from inertial loading of the head and include interhemispheric subdural hemorrhage and diffuse axonal injury. Head injury or traumatic brain injury traumatic brain injury (TBI) has been a large contributor to mortality and morbidity throughout the ages, but a number of developments of modern living have served to increase the number of cases of TBI in the present day. One of these developments is the proliferation of motor vehicles, which are common causes of TBI. Another commonality in the modern world is the continuing violence from gunshot wounds (GSWs). Even the increased longevity of the population has contributed to TBI from falls in the elderly and infirm. Traumatic brain injury (TBI) can be classified into static and dynamic injuries, depending on the rate with which force is loaded to the head. Static injuries occur over longer time periods—usually greater than 200 milliseconds (msec)—and cause crushing head injury. Crushing head injuries are relatively rare and are caused when a massive weight crushes the stationary head and results in comminuted fractures of the calvarium, facial skeleton, and skull base, with fracture contusions and fracture lacerations of the brain. Because the dura is attached to the skull, differential movement between the skull and the brain may strain and tear bridging veins to the point of failure and cause bleeding into the subdural space. The inertial movement of the brain is maximal in the cortex but extends into the brain with greater forces. It is this inertial movement of the brain that results in traumatic diffuse axonal injury. Examination of the head is carried out in most autopsies, although a few autopsies omit the head when interest is focused on only a heart, lung, or abdominal issue. Sometimes families ask that the head be spared when an autopsy is being carried out. In most autopsies, however, the examination of the head is of vital importance. Hospital autopsies are significantly different in their approach and interests than autopsies done by medical examiners and forensic pathologists. Hospital autopsies are primarily focused on determining why the patient has died, evaluating the effects of therapeutic efforts, and determining the accuracy of diagnostic procedures. Forensic autopsies are carried out to determine the cause of death and the manner of death (natural, accident, suicide, homicide, undetermined), as well as to carry out other functions relating to identification of the body, obtaining evidence and toxicology specimens from the body, evaluation of injury patterns, documentation of disease states, evaluating mechanisms of injury, retrieval and protection of personal property, and consideration of forensic issues, such as time of death. In determining the manner of death, the pathologist needs to have additional information regarding the circumstances surrounding the death and may also need other information, such as past medical history. The autopsy findings are then considered along with all the additional information before decisions are made about manner of death. Arachnoid – A thin membrane that lies over the brain above the pia mater, which is a fine, delicate membrane that lies immediately over the brain. The space between the pia and arachnoid is the subarachnoid space and holds the spinal fluid. Axons – The microscopic filaments of the nervous system. These axons are the extensions of the neurons and carry the activities of the nervous system from one point to the next. Calvarium – The portion of the skull that surrounds the cerebral hemispheres. Contrecoup contusion – The pattern of brain contusions caused by a falling head impacting on a firm surface. The contusions are distributed over the orbital surfaces of the frontal lobes and the frontal and temporal poles; the heaviest distribution of contusion is opposite the point of impact. Contrecoup contusions are caused by movement of the brain over the bony ridges of the anterior and middle cranial fossae. 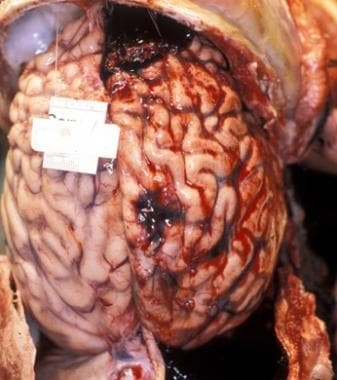 Contusion – Streaklike hemorrhages and foci of necrosis of within the cortical laminae extending from the outside inward; with aging, contusions form cortical defects where the tissue has been lost. Coup contusion – Contusion of the brain beneath the point of impact underlying an intact skull; this injury is related to a stationary head struck by an impact. Dura – A thick membrane that separates the brain from the skull and lies on the inner table of the skull. The dura is actually the periosteum of the skull. Galea – Layers of the scalp. Inflammatory response – This is the response of vascularized living tissue to damage. Laceration – This injury involves a tear or disruption in tissue. Skull base – This is the portion of the skull on which the brain sits. Suture – A suture is the juncture between bones of the skull where ossification will occur and unite the bones. Knowledge of the scene of injury or where an individual was found deceased is of importance in properly evaluating the findings at autopsy. A person found dead in an alley could have died of natural causes, been assaulted, fallen from a standing height or out of an adjacent building, or been struck by a vehicle. The neuropathology findings will be of upmost import in deciding which of these possibilities is true, but autopsy findings must always be considered in conjunction with the known circumstances. Photographs of the scene where the individual was found dead are of great importance in interpreting the injury mechanism and patterns of injury when the injury involves the head. Photographs during the autopsy of the head with hair shaved from the areas of external injury as well as photographs inside the cranial cavity and of the brain should be taken to document the trauma and to assist with correlation with scene and historical information. Trace evidence may be present on or in the body in cases of head injury. In the image shown below, an elderly woman's head was struck against the soap dish in a bathtub multiple times, which caused lacerations of the scalp and fracture of the spine. Fragments of the porcelain of the soap dish were embedded in the lacerations and were removed and sent to the crime laboratory for analysis. Similarly, in a case in which a victim has been beaten with a piece of wood, fragments of that wood may be embedded in the wounds, and retrieval of that material may lead to finding the weapon used in the assault. All wounds should always be searched for trace evidence. 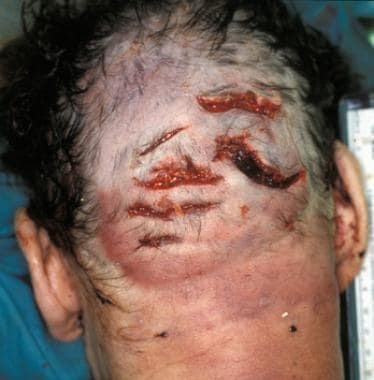 Lacerations of the occipital scalp in a 78-year-old female who was assaulted in her home and found dead in the bathtub. On the occipital scalp are 7 lacerations. The hair has been shaved to better reveal the wounds. There was accompanying hemorrhage within the subgaleal tissue of the scalp but there were no skull fractures or intracranial injury. The lethal injury was a displaced fracture of C1. Blood within the subdural area may be retrieved and used for toxicology analysis (eg, blood alcohol level). The drug and alcohol concentrations in these physiologically isolated specimens may more accurately depict levels present near the time of the injury that caused the subdural bleeding than blood taken at the time of autopsy following prolonged survival. Because the drugs or alcohol in the peripheral blood present at the time of injury may have metabolized away by the time of death, the blood from the subdural area may provide an earlier specimen. Subdural hematomas, however, are not completely immune to drug and ethanol metabolism. Unfixed cerebral tissue may also be used for receptor analysis in cases of acute cocaine toxicity and excited delirium. Significant alterations in heat shock proteins (HSP) and dopamine receptors may be seen in cases of excited delirium. In cases of gunshot wounds to the head, bullets or bullet fragments and jackets or portions of jackets may be recovered from the head and submitted for evidence. Likewise, in cases of stab wounds, broken knife blades may be evidence that might be found. Blunt trauma of the head, skull fractures, immediate impact injury, penetrating injuries, and intracranial hemorrhages will be discussed in the following sections. Blunt force trauma is frequent about the face, neck, and scalp. Abrasions are injuries in which a rough surface has impacted the body, and areas of the skin surface have been scraped away. On the head, abrasions are usually seen over the prominences of the forehead, nose, cheeks, and chin. Certain patterns of abrasion may indicate a mechanism for the injury. Dicing abrasions, for example, are angulated or rectangular abrasions caused by fragments of the tempered glass of the side windows of automobile doors. Dicing abrasions may be useful in discriminating between a driver and passenger in vehicular accidents. Contusions or bruises are caused when a blunt object or surface impacts the body and damages subcutaneous small blood vessels, which then bleed into the soft tissue and produce an area of discoloration at the skin surface. When the injury first occurs, contusions tend to be red, purple, or blue. Older contusions may change to green, yellow, or brown as the blood within the injury is broken down by the inflammatory process. Contusions point to sites of blunt force impact that may be related to underlying intracranial injury. Blunt trauma to the scalp frequently does not produce an externally evident contusion due to the multilayered nature of the scalp and its ability to absorb energy. 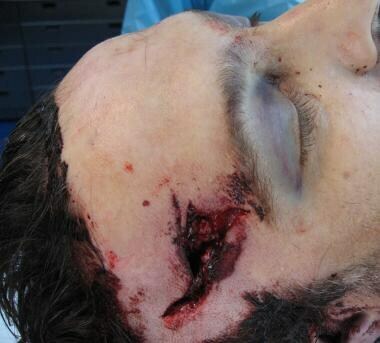 At autopsy, however, impact sites can be readily noted as hemorrhage within the galea of the reflected scalp. Pathologists can age these injuries by taking sections for microscopic examination and evaluating the progress of the inflammatory reaction to the injury. Lacerations are blunt force injuries in which the skin surface is torn open due to compression between the impacting object and an underlying bony structure. The wound edges are often abraded and the depths of the wound contain tissue bridges or strands of tissue. A variety of patterns of lacerations can be recognized, such as those that result from linear objects and hammers, as seen in the images below. Care should be taken to distinguish sharp force wounds (eg, cuts) from lacerations. Round-faced hammer wounds of face in a 24-year-old female who was the victim of an assault. On the lower left and upper right forehead are 2 abraded lacerations from hammer blows. These blows caused depressed skull fractures and fracture contusions of the brain which resulted in brain swelling and subsequently death from tentorial herniation. Tack hammer wounds of the face in a 30-year-old female who was assaulted. On the left side of the face are a number of lacerations from impacts with the hammer shown in the illustration. These blows caused numerous lacerations with underlying depressed skull fractures, fracture contusions of the brain, and brain swelling causing tentorial herniation and death. Ecchymosis refers to discoloration on the skin surface caused by blood in the subcutaneous tissue that has tracked along tissue planes from an adjacent point of injury into the subcutaneous tissue beneath the discoloration. Ecchymoses resemble contusions, which are blunt force injuries directly at the point where a blunt impact has occurred. In head injury, there are 2 ecchymoses which should be recognized. Periorbital ecchymosis is discoloration of the upper and lower eyelids and orbital soft tissues that is caused not by direct impact to the orbit but by fracture of the orbital roofs of the anterior cranial fossa (see the following image). Periorbital ecchymoses with prominent blue discoloration of the periorbital tissues in a 40-year-old man who shot himself in the right lateral forehead with a .357 magnum. The bullet exited from the left lateral frontal region. Both orbital regions demonstrate heavy blue discoloration called periorbital ecchymoses. The fractures then allow blood to move downward from the fracture sites into the orbital fat and subcutaneous tissues of the orbits to produce discoloration of the upper and lower eyelids and orbital soft tissues. The periorbital hemorrhages resemble contusions and are similar to a "black eye," but they do not imply blunt trauma directly to the orbital area. Any mechanism which fractures the orbital plates of the anterior cranial fossae may produce these ecchymoses. Fractures of the anterior cranial fossa can be caused by falls with impact to the back of the head or gunshot wounds (GSWs) through the frontal or parietal bones. The Battle sign or mastoid ecchymosis is discoloration of the skin surface overlying the mastoid area behind the ear, as shown below. Battle sign with bluish discoloration of left ear and surrounding soft tissue in a 32-year-old male who was the driver of a motor vehicle that was struck broadside on the driver's side by another vehicle. The left ear and postauricular area demonstrate bluish discoloration, which resembles a contusion. The discoloration or ecchymosis is caused by an underlying fracture of the petrous portion of the temporal bone in the middle cranial fossa. The fracture damages small branches of the internal carotid artery, which then bleed into the adjacent soft tissues, and the blood appears at the skin surface as the ecchymosis. Blows to the lateral or posterior aspects of the head may result in fractures of the middle cranial fossa with a resulting Battle sign. This appearance should alert the examiner to the likelihood of an underlying basilar skull fracture in the region of the middle cranial fossa (see the following image). Fractures of the middle cranial fossa. A subgaleal hemorrhage is blood within the galea or, commonly, just within the tissues of the scalp (see the image below). Impacts of blunt trauma may not leave external evidence of contusion on the scalp, but these injuries are usually accompanied by the presence of hemorrhage into the subgaleal soft tissues. Areas of subgaleal hemorrhage may also be observed on computed tomography (CT) scans of the head. Subgaleal and subperiosteal hemorrhages extensive over the scalp and skull of a 19-year-old female who was the driver of a motor vehicle which veered off the road and struck a tree. 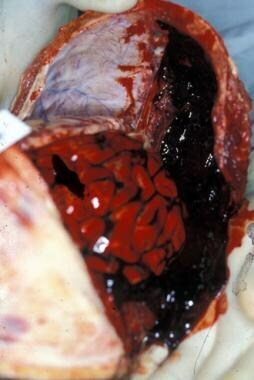 There is massive bleeding into the soft tissues of the scalp and heavy subperiosteal hemorrhage over the skull. Fracture of the skull denotes that sufficient force has been applied to the head that exceeds the ability of the bone to bend without breaking. Skull fracture may or may not be accompanied by intracranial injury, but in the more common circumstances, this injury does indicate that the head has received an impact. Linear fractures are the most common fractures at all ages and account for some 70% of all fractures. These injuries occur in both the calvarium and the skull base, are caused by broad-based forces striking the head over a wide area, and are common in accidents such as vehicular collisions and falls (see the image below). A linear fracture is a simple crack and may have additional extensions of stellate form, which should then be considered a complex linear fracture. Linear fracture of the left frontal and parietal bones with diastasis of the coronal suture in a 26-year-old man who was a passenger in a vehicle struck head on by another vehicle. The separation of the coronal suture is a diastatic fracture. Depressed fractures are those in which the bone is displaced inward and may impinge upon the dura and brain, creating complications from cortical contusion and laceration. Depressed fractures are caused by a forceful impact striking over a small area and occur in circumstances such as falls onto a protruding object and impact with instruments such as hammers. These fractures require careful documentation, photography, and possible retention as they may provide invaluable information as to the type of weapon that caused the injury. A comminuted fracture is one in which the bone fractures into fragments and is caused by a significant force striking over a broad area. Comminuted fractures occur in crushing head injuries and from repeated blows to the head by a blunt object, as seen in the following image. Portions of the fractured bone may impinge upon the underlying brain and cause contusions of the cortical surface called fracture contusions. Comminuted fractures of the right frontoparietal skull in a 68-year-old man who was assaulted by multiple blows to the head by a crowbar. A diastatic fracture results when a suture is forcefully opened; this requires significant force. These fractures usually occur early in life but may be seen at any time and are particularly common in traffic accidents (see the image below). Marked brain swelling frequently causes sutural separation in young children before the sutures are fused, but these separations are not fractures. Compound fractures are those associated with laceration of the surface soft tissues and create the possibility of complications from contamination of these wounds. Fractures can originate in the skull base or in the calvarium, and they can extend from one portion of the skull to the other. Fractures of the skull base are prone to a variety of complications due to the possibility of lacerating the vessels or nerves entering or leaving the intracranial compartment. Several recognizable patterns of basilar fracture are common in forensic practice. [8, 9] Fractures of the orbital plates associated with periorbital hemorrhages are common and are caused by gunshot wounds of the head, falls onto the back of the head, and vehicular accidents. The ring or circle fracture is a fracture around the foramen magnum through the middle and posterior fossae. Ring fractures are most commonly caused by severe hyperextension of the head on the neck during a traffic accident. A less common mechanism is landing on the feet from a high fall or jump, such that the vertebral column is driven upward into the skull base, resulting in a "pithing." 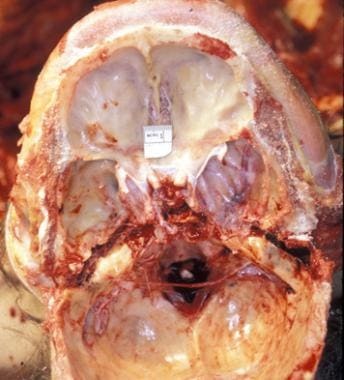 The hinge fracture is fracture extending across the middle cranial fossa through the petrous portions of the temporal bones, such that bleeding is to be expected from the ear(s) (see the image below). Hinge fractures result from very forceful impacts and are most common in vehicular accidents, although these injuries are occasionally seen in other types of trauma. The impact is usually to the side or posterior of the head. Hinge fracture extending across both middle cranial fossae in a 40-year-old male who was the driver of a vehicle which was stopped in traffic on a highway and struck from behind by a dump truck. There is a deep hinge fracture extending across the right and left middle cranial fossae through the petrous ridges of the temporal bones. Brain, fracture, coup and contrecoup, and herniation contusions; crushing head injury and falls from a great height; traumatic diffuse axonal injury; and brainstem avulsion are reviewed in this section. Brain contusions are bruises of the cortical surface that damage the surface from the outside extending inward, producing disruption of tissue and vessels. The resulting lesion is a wedge-shaped, devitalized area of punctate and streak hemorrhages extending through a variable depth of the cortex. With greater forces or in patients with bleeding problems, hemorrhage may extend into the adjacent subcortical white matter. Subarachnoid bleeding in the adjacent leptomeninges always accompanies contusion. In surviving patients, contusions undergo changes related to the inflammatory response, with removal of necrotic tissues resulting in a cavitated scar with surrounding gliosis and hemosiderin staining of the leptomeninges. Contusions may be classified into a number of useful categories based on the mechanism of the injury. Contusions that occur at the site of skull fracture are fracture contusions. If the fracture lacerates the brain, the lesion is a fracture laceration, as seen in the following image. The contusions consist of small streak or punctuate hemorrhages within the cortical surface with overlying subarachnoid hemorrhage. Fracture contusions of the right inferior frontal and superior and middle temporal gyri in a 38-year-old man who was beaten with a garden hoe. There were comminuted fractures of the right frontal and temporal portions of the calvarium. Those fractures resulted in extensive fracture contusions of the adjacent cerebral convolutions. On coronal section, there are hemorrhages within the cortex that occupy varying depths of the cortex, and some extend into the underlying white matter, as illustrated below. Fracture contusions occur beneath areas of fractured bone and are described as fracture contusions to distinguish them from other types of contusion that may indicate a stationary or moving head mechanism, such as the coup or contrecoup contusions. Coronal section of the cerebral hemispheres in a 38-year-old man beaten with garden hoe. Deep fracture contusions of the right frontal and superior and middle temporal gyri are shown. A coup contusion is caused by a blow to the stationary head, with an intact skull at the site of impact. The contusion occurs beneath the point of impact on the convex and lateral surfaces of the brain and tends to be much less severe than contrecoup contusions. Contrecoup contusions result from a moving head impacting a surface in many common types of falls. Examples of such falls include an adult abruptly losing balance and falling from standing height backward or to the side, falling down stairs, or jumping from a moving vehicle. Falls from heights greater than 15-20 feet and children younger than about 4-5 years typically do not demonstrate this pattern of contusion. The injuries are frequently massive deep contusions and may cause hemorrhage to burst through the cortex and leptomeninges into the subdural space, resulting in overlying subdural hemorrhage or the "burst lobe." The mechanism of injury in contrecoup contusions is not certain, but it is most easily understood by Holbourn's rotational shear force theory, which was developed from studies of brain movement in relationship to head movement. Movements of the head which cause the brain to impact the rigid shelves of bone of the anterior and middle cranial fossae create contusions over the orbital surfaces of the frontal lobes, the frontal poles, the temporal poles, and the lateral surfaces of the temporal lobes (see the following images). Remarkably, the greatest extent of contusion is found opposite the point of impact to the head. Contrecoup contusions of the medial aspects of the orbital gyri and ventral surfaces of the temporal lobes in a 45-year-old man who fell off a bar stool and hit the back of his head. There are contrecoup contusions in this fixed brain specimen in the right and left orbital gyri and the right and left inferior temporal gyri. Very heavy contrecoup contusions over the frontal poles, orbital surfaces, and temporal lobes with overlying subarachnoid hemorrhage in a 27-year-old man who was punched in the face and fell backward, striking his occiput on the ground. Autopsy demonstrated fracture of the occipital bone, a thin layer of subdual blood over the cerebral convexities, and extensive contrecoup contusions covered with subarachnoid hemorrhage. 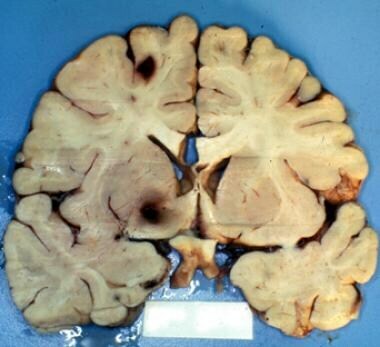 Horizontal section of cerebral hemisphere in a 27-year-old man who was punched and fell backward. Very heavy contrecoup contusions extending through the cortex into the underlying white matter are shown. Herniation contusions result from massive forces thrusting the brain against the skull base or a dural boundary. These contusions are frequently seen over the hippocampal, parahippocampal, and occipitotemporal gyri following GSWs to the head. A crushing head injury refers to a stationary head that is impacted one or more times by massive forces, causing comminuted fractures of the skull, with fragments of bone contusing and lacerating the brain. The resulting contusions should be described as fracture contusions. Examples of these injuries include homicidal assaults with weapons such as choppers (eg, machetes) or cleavers, or crushing the head by an automobile wheel or industrial apparatus. Because the head is stationary, consciousness may be maintained during these injuries, until brain swelling causes significantly increased intracranial pressure. Falls from a height greater than 15-20 feet may be considered a "great height," as it is at that point that falling head injuries lose the contrecoup pattern of contusion, and the injuries consist of multiple skull fractures with fracture contusions and lacerations of the brain. These injuries look much like the crushed head injury. Diffuse axonal injury (DAI) refers to diffuse damage to the axonal processes and may result from either traumatic injury or from hypoxic ischemic injury. Traumatic DAI (TDAI) is an injury caused by forces which move or accelerate decelerate the head and result in inertial damage to axonal processes and the vascular adnexae. Such forces may be caused by either impact to the head or an impulse shaking mechanism in which movement of the body causes the head to be abruptly accelerated and decelerated. Either of these mechanisms causes the brain to move abruptly within the cranial cavity somewhat differently than the more rigid skull moves. Differential movement of the brain causes disruption of axonal processes beginning earliest at the periphery of the brain and extending inward, this is particularly damaging at sites where the adjoining tissues are nonuniform. As axonal processes are torn, nearby small vessels also tear, and these vascular injuries produce the grossly recognizable hemorrhagic lesions seen in TDAI. Streak hemorrhages occur diffusely within the brain, most notably in the subcortical white matter, corpus callosum, deep gray structures of the basal ganglia, and the lateral extensions of the rostral brainstem (see the following images). [13, 14] As axonal processes are disrupted at deeper and deeper levels, clinical symptoms reflect this damage to neuronal connections. When significant axonal damage occurs at the level of the deep gray structures and upper brainstem, the clinical symptom is immediate unconsciousness (traumatic unconsciousness). Coronal section of the brain shows streak hemorrhages in the subcortical and deeper white matter of the frontal lobes that are greater on the right than on the left. On the left, a few hemorrhages are seen at the lateral margin of the corpus callosum. Brainstem sections showing streak hemorrhages in the midbrain and pons. A 72-year-old man was a passenger in a vehicular accident in which he was rendered immediately unconscious. He presented to the emergency department with a Glasgow coma scale of 3 and survived 20 days without regaining consciousness. Computed tomography (CT) scans of the head showed evidence of shearing injury in the left basal ganglia and several punctuate hemorrhages in the left hemisphere, which enlarged over time on sequential CT scans. 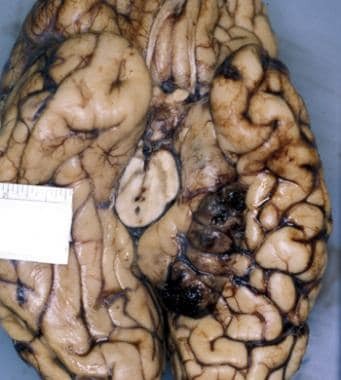 At autopsy, there were 2 large areas of hemorrhage in the left frontal white matter and in the left basal ganglia which had developed from smaller streak hemorrhages. TDAI most commonly occurs in victims of traffic accidents in which severe acceleration-deceleration forces are encountered (see the images below). Less commonly, TDAI is seen in other types of incidents such as falls and assaults. [15, 16] The inertial movement of the brain which tears the axonal processes also tears the vascular adnexae of the brain. These adnexae are the bridging veins that extend from the cortical surface of the brain into the venous sinuses and, when torn, result in subdural bleeding. In most cases of TDAI, there will be at least small amounts of blood in the subdural space. In these cases, the subdural blood is rarely of clinical significance. Rather, it serves as a marker that a significant acceleration-deceleration event has occurred. 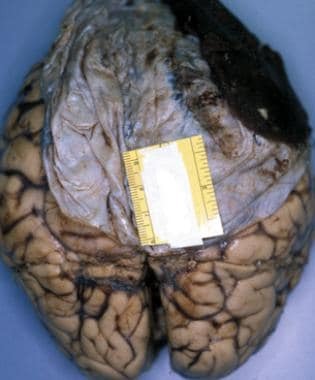 Brain specimen from a 32-year-old man who was the driver of a car which struck a telephone pole at a high rate of speed. He was dead at the scene. Autopsy revealed no skull fractures. There was a thin layer of subdural blood over the cerebral convexities. This fixed brain demonstrates subarachnoid hemorrhage over the surface of the posterior parietal and occipital lobes. A 40-year-old woman was the driver of a motor vehicle which crashed at high speed; she survived 3 days unconscious in the hospital. 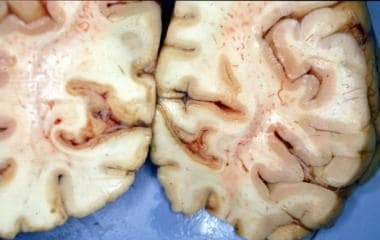 At autopsy, there was a punctuate hemorrhage in the left centrum semiovale adjacent to the lateral margin of the corpus callosum. Numerous streak hemorrhages were present in the frontal white matter, corpus callosum, and the thalamus. Tearing of axons cannot be seen grossly, but it is frequently associated with damage to adjacent small vessels, and the torn vessels may be seen grossly as streaklike hemorrhages. Similar to the distribution of axonal damage, streak hemorrhages occur in the subcortical white matter, the periventricular gray matter, the corpus callosum, and the rostral extensions of the brainstem. After about 24 hours, axonal damage may be visible microscopically as retraction bulbs, which appear as accumulations of axoplasm in bulbar form at the site of axonal disruption (see the image below). Small areas of vascular damage which initially appear as streak and punctate hemorrhages can enlarge over time if there is survival. Microscopically, a high-power view of the corpus callosum demonstrates acute hemorrhage adjacent to a number of well-developed axonal retraction bulbs. Brainstem avulsions are tears at the pontomedullary or cervicomedullary junction usually caused by extreme hyperextension of the head in a vehicular accident. The disruption may be partial or complete, and any survival period will depend upon the completeness of the tear. These injuries are associated with overlying subarachnoid hemorrhage and usually occur in conjunction with TDAI. Pontomedullary tears or avulsions are usually caused by very forceful hyperextension of the head, and many are associated with a ring fracture of the cranial base, as shown in the following image. In some cases, particularly motor vehicle accidents in which the decedent has insufficient injuries to explain death, it may be beneficial to section the brainstem and upper cervical cord in a midline sagittal section to best demonstrate pontomedullary laceration. Sagittal section of brainstem showing a tear partially separating the pons and medulla in a 37-year-old woman who was the driver of a motor vehicle that was struck from behind by a tractor trailer truck. She was dead at the scene. Autopsy demonstrated a pattern of ring fracture in the basilar skull in which the fracture extended around the foramen magnum in the posterior and middle cranial fossae. 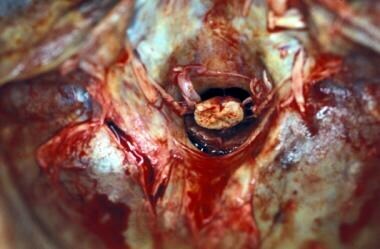 The brain showed a pontomedullary tear with a laceration partially separating the pons from the medulla. A sagittal section through the brainstem and cerebellum demonstrates the deep laceration at the pontomedullary junction. Fracture contusions are present in the pons. Subarachnoid hemorrhage was present over the ventral surface of the brain and brainstem. Firearms and stab wounds of the head are reviewed in this section. 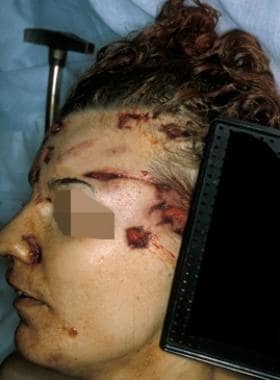 Gunshot wounds (GSWs) of the head are very common injuries. Penetrating GSWs are those in which the missile enters the head and does not exit. Perforating GSWs are ones in which the missile enters the head, passes through the brain and skull, and exits the head. The behavior of a missile passing through the head depends upon a number of factors, including the type of weapon, the caliber of the missile, the bullet construction, and the range of fire. With shotgun wounds of the head, the extent of tissue injury depends primarily on the range of fire. At contact range, these will usually result in devastating injuries as large amounts of gases as well as shot enter the cranial cavity. Close-range shotgun injuries also result in large, excavated defects. 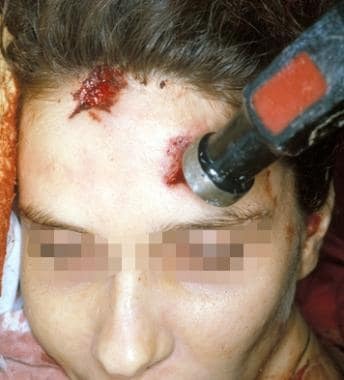 Rifle wounds to the head caused by high-velocity missiles also tend to be perforating and result in massive disruption of tissue due to dissipation of significant kinetic energy with the rigid confines of the skull. Medium- to large-caliber, contact GSWs of the head often exit, but hollow-point rounds may stop within the head or beneath the scalp. Of GSWs to the head caused by handguns, at close and contact range, about 30% will perforate the head, and about 30% will perforate the skull. Small-caliber, low-velocity missiles may ricochet within the head to create secondary pathways, whereas others come to rest beneath the skull or the scalp. Bullets passing through the bone of the skull typically do so with a widening cone of fracture of the inner and outer tables of the calvarium. An entrance wound will thus demonstrate a wider bevel on the inner table (internal beveling), and an exit wound will demonstrate a wider bevel on the outer table (external beveling). An exception is the tangential wound, which demonstrates a combination of the 2 patterns in one ovoid fracture, known as the keyhole defect, that represents both the entrance and exit sites in the skull. Low-velocity bullet wounds of the brain consist of fracture contusions surrounding the entrance and exit defects of the brain; these wounds cannot be distinguished as to which is which. 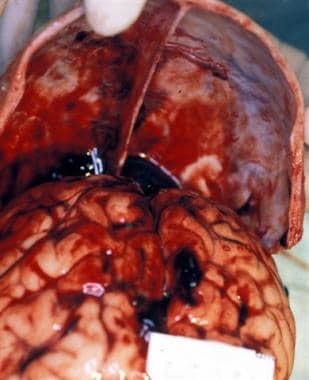 Bullet wounds usually have subarachnoid hemorrhage over the brain defects, and the hemorrhage may extend over most of the brain. 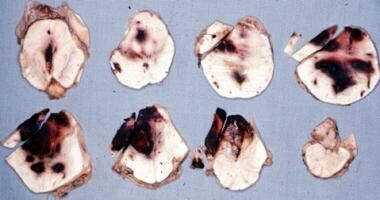 Bullet pathways through the brain consist of macerated brain mixed with blood and possibly bone fragments. The bone fragments will be closer to the entrance wound. High-velocity wounds are usually very damaging at any distance. These wounds often result in tearing open of the head with extensive fractures and, at close range, may cause the brain to be extruded. 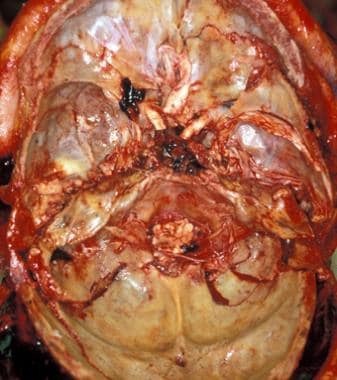 Shotgun wounds at close or contact range are also very damaging and result in massive injuries, often with extrusion of the brain. Stab wounds of the head are much less common than GSWs, and their damage is much less devastating than GSWs. Stab wounds are most likely to penetrate through the thinner portions of bone, such as the squamous portion of the temporal bone or the orbits. Any stab defects in the skull should be carefully documented, photographed, and possibly retained, as they may prove useful in determining the dimension of the blade that inflicted them. The damage caused by a stab wound to the head is related to severing of tissues, as well as the resulting complications of hemorrhage and later infection. In this section, epidural, subdural, subarachnoid hemorrhage, and intracerebral hemorrhage; increased intracranial pressure; and abusive head injury in infants and young children are reviewed. 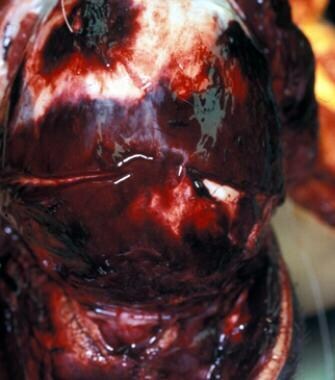 Epidural hemorrhage is bleeding that lies beneath the skull and over the dura, caused by impacts to the head. These injuries are most often (85%) but not always associated with a skull fracture. Epidural bleeding is due to torn branches of the middle meningeal artery which lie on the inner table of the skull or, rarely, from a torn venous source, such as a sinus or diploic vein. Small amounts of epidural blood may resolve without further problem. Larger amounts of epidural blood may create problems to the patient either by the mass of the epidural blood alone or in combination with brain swelling. Clinically, there is a typically a lucent interval following the impact. If epidural bleeding becomes large enough to create significantly increased intracranial pressure, the patient appears increasingly lethargic and then becomes unconscious. The amount of epidural blood necessary to create a mass effect is about 100 milliliters (mL) in an adult. In younger individuals, impact without fracture may produce cranial distortion and strip the dura off the bone to cause epidural bleeding. Fewer epidural hemorrhages are seen in the very young and in the elderly, because the dura is very firmly adherent to the bone and is difficult to strip off. Epidural hemorrhage tends to lie over the cerebral convexities but may also occur over the ventral surface on the base. 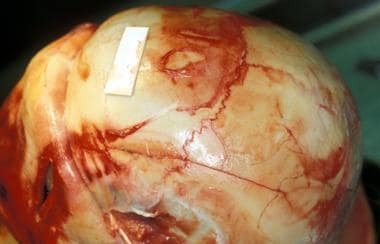 Because epidural hemorrhages lie above the dura, they tend to take on a biconvex lens-like configuration and produce a sharply outlined impression on the underlying brain, with the gyri being markedly flattened out (see the following image). Brain beneath an epidural hemorrhage frequently demonstrates fracture contusions caused by the accompanying fracture. A 10-year-old boy was riding a bicycle without a helmet and fell, striking his head on the pavement. At the scene, he was awake and combative. He was transported to a hospital where he became lethargic and was intubated to protect his airway. X-rays of the head demonstrated a fracture of the right temporal bone. Computed tomography scan of the head showed an epidural hemorrhage over the right lateral convexity. He rapidly decompensated and died before he could be transferred to a medical center for neurosurgery. At autopsy, there was a linear fracture of the right temporoparietal calvarium and an epidural hemorrhage of 90 mL of blood over the right frontotemporal convexity. Epidural hemorrhage as an isolated injury without other traumatic brain injury should have little morbidity or mortality. If there are symptoms of increasing intracranial pressure, once brought to medical attention, these hemorrhages are readily diagnosed with imaging studies. Once identified, epidural hemorrhage can be readily removed surgically; however, epidural hemorrhages associated with other brain injuries have a more poor prognosis. 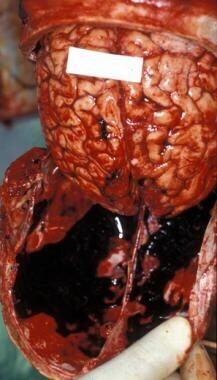 Subdural hemorrhage is bleeding beneath the dura and over the surface of the arachnoid membrane. Nontraumatic causes of subdural bleeding are ruptured berry aneurysms and hypertensive hemorrhages in which blood ruptures through the arachnoid membrane from the subarachnoid space into the subdural space. Traumatic subdural hemorrhage is very common, and although it may result from tearing of a venous sinus or an arachnoid artery, very often subdural bleeding results from tearing of one or more bridging veins. Subdural bleeding lies over the cerebral convexities as well as the base and tends to be unilateral in adults . The amount of blood required to produce a mass effect depends upon the age of the individual and state of development of the brain. In all ages, very small amounts of subdural blood may be very significant as a marker of diffuse brain injury. Young children may develop increased intracranial pressure when the amount of blood reaches 30-50 mL; in adults, 100-150 mL of subdural blood will produce a mass effect. Individuals with brain atrophy from age or alcoholism may require greater amounts of blood to cause significantly increased intracranial pressure. These same individuals, however, by virtue of their cerebral atrophy, may be at increased risk for developing subdural bleeding related to tension on their bridging veins. Furthermore, alcoholics with cirrhosis may be coagulopathic, and elderly individuals may be on medications such as coumadin. Relatively trivial head trauma can result in significant bleeds in these populations. 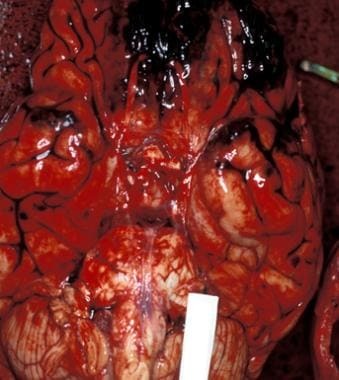 The cortical surface beneath a layer of subdural blood frequently demonstrates foci of subarachnoid hemorrhage, because the bridging veins are wrapped by a layer of arachnoid and, when torn, small amounts of bleeding also enter the subarachnoid space. The brain surface beneath a collection of subdural blood may be flattened in a crescent shape, but this finding will not be as uniformly flattened as seen with an epidural hemorrhage (see the images below). A 26-year-old man was the driver of a motor vehicle traveling at high speed that left the roadway and overturned multiple times. He was ejected 16 feet from his vehicle and was unresponsive at the scene. Emergency services responded immediately and intubated him at the scene, then transported him to the nearest trauma center, where he was without respirations and had dilated and fixed pupils. Computed tomography of the head showed a thin layer of subdural blood over both cerebral convexities. He died a short time later despite continued resuscitation. Autopsy demonstrated a thin layer of liquid subdural blood over the cerebral convexities and over the basilar surfaces. After an evening of drinking, a 60-year-old alcoholic man was found lying unconscious at the bottom of the basement stairs at his home. He was taken to the hospital where he died the following day. 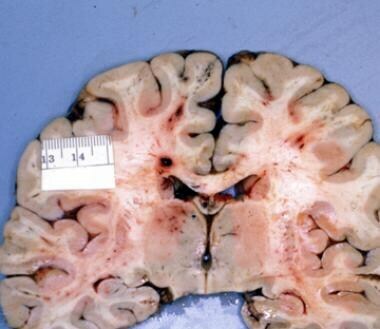 Autopsy demonstrated a thick layer of acute subdural blood over the left cerebral convexity. Blood which remains in the subdural space over time may transform into a chronic membrane in certain circumstances, but not in all cases. Subdural blood in an individual with a previously normal brain will resolve rather rapidly or be rapidly organized in most cases. In particular circumstances, the appearance of a classic chronic subdural membrane develops. To develop such a chronic membrane requires the presence of a lowered intracranial pressure as a result of brain atrophy (elderly or alcoholic patients) or individuals who have been surgically shunted for hydrocephalus. In patients with lowered intracranial pressures, small amounts of bleeding into the subdural space induces an ingrowth of granulation tissue from the dural side. Minor trauma may result in microbleeding in the fragile microvasculature of the granulation tissue. A repeated cycle of induced growth and bleeding may result in a thick classic membrane in this group of individuals. Subarachnoid hemorrhage is bleeding into the subarachnoid space, the space between the pia mater and the arachnoid, and is usually occupied by the cerebrospinal fluid (CSF). Natural causes of subarachnoid hemorrhage are ruptured berry aneurysms and vascular malformations. Trauma very frequently causes subarachnoid bleeding, and it is seen in association with contusions, lacerations, and penetrating injuries (see the image below). A 53-year-woman was a passenger in a vehicle which overturned after colliding with a tree. She was unresponsive initially and remained so until she died the following day. 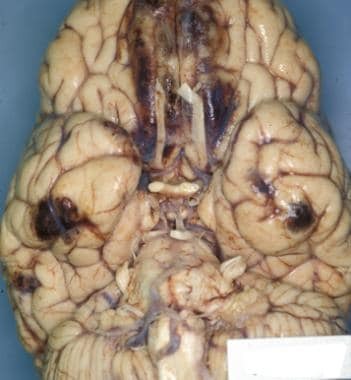 At autopsy, there was subdural hemorrhage over the right cerebral convexity with underlying subarachnoid hemorrhage in patches over the right cerebral convexity. An intact bridging vein is visible in the left frontal area. Traumatic basilar subarachnoid hemorrhage is a rare injury most often caused by damage to a vertebral artery at C1 related to lateral movement of C1 if the head or neck is struck firmly. Tearing of the vertebral artery or dissection of the vascular lamina of the vertebral arterial wall can result in blood tracking upward to lie in a thick layer over the ventral surface of the brainstem and cerebellum. The distinction between subdural and subarachnoid hemorrhage is easily made by the naked-eye examination of the brain and by simply wiping the gloved hand over the brain to see whether the blood will wipe away (subdural blood) or whether the blood is beneath the arachnoid and does not wipe away (subarachnoid blood). 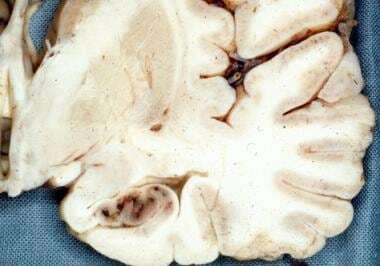 Traumatic intracerebral hemorrhage is bleeding within the substance of the brain and can arise from adjacent contusions by extending from the cortex into the subcortical white matter or by the smaller hemorrhages of traumatic diffuse axonal injury becoming larger. 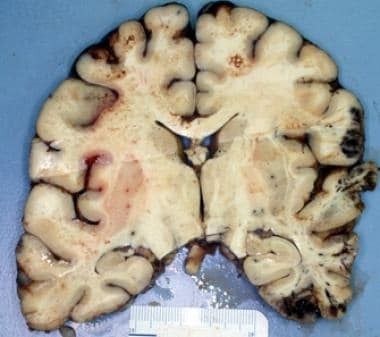 Traumatic intracerebral hemorrhage in the right frontal and temporal lobes arising from contusional bleeding in the cortex in a 62-year-old woman who was assaulted about the head with a hammer. She survived the attack by 23 hours and was initially conscious and able to describe her attacker. She then became lethargic and went on to become unconscious. Despite surgical intervention to debride her wounds, she died of increased intracranial pressure. Autopsy demonstrated multiple comminuted and depressed fractures of the right frontal and temporal bones with underlying fracture contusions of the frontal and temporal lobes. Several of the deepest contusions showed hemorrhage extending from the cortex into the underlying white matter, producing traumatic intracerebral hemorrhage. Increased intracranial pressure is a common complication of head injury. Both intracranial hematomas and brain swelling resulting from a variety of injuries to the head may cause increased intracranial pressure. Because there is only a limited amount of space that may be occupied by the increased volume of a swollen brain or intracranial hemorrhage, serious complications result from the increased pressure. Intracranial pressure that becomes significantly elevated may result in the process of herniation, as portions of the brain move toward adjacent areas of lower pressure. Herniation may occur in the cingulate gyrus, the medial temporal gyrus or the uncus, the hypothalamic structures, and the cerebellar tonsils. In tentorial herniation, the medial portion of the temporal lobe on the side of the increasing pressure may encroach upon the tentorium and herniate under it to displace the brainstem laterally and caudally (see the following image). Left tentorial herniation with hemorrhage and necrosis of left temporal lobe in a 68-year-old man who sustained a large left subdural hematoma from a fall in his home. He died after 3 days in the hospital. 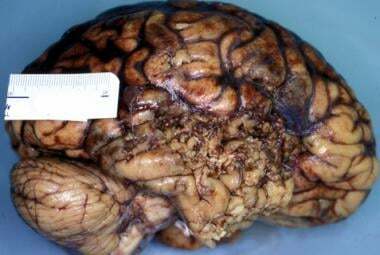 Autopsy demonstrated marked brain swelling with a large left tentorial herniation. The medial portion of the left temporal lobe is hemorrhagic and shows early necrosis. There is lateral deviation of the brainstem to the right, causing the right cerebral crus to impinge upon the right temporal lobe. Such displacement of the brainstem has devastating effects. Compression of the brainstem vessels may result in ischemia and may cause secondary brainstem or Duret hemorrhages, which are lethal (see the image below). These should not be confused with primary brainstem cerebrovascular accidents ("strokes"). In decisions about the cause of death in individuals with Duret hemorrhages, these should not be considered the cause of death, although they are the mechanism of the lethal derangement resulting in death. The true cause of death is the disease or injury which initiated the chain of events ultimately leading to their formation. Secondary brainstem hemorrhages in the midbrain and pons. Tentorial herniation causes pressure on the posterior cerebral arteries by the compression of the temporal lobes against the tentorium, which then causes hypoxic damage to portions of the brain supplied by those arteries. Infarction or ischemic necrosis then results on the ventral surface of the occipital lobe. 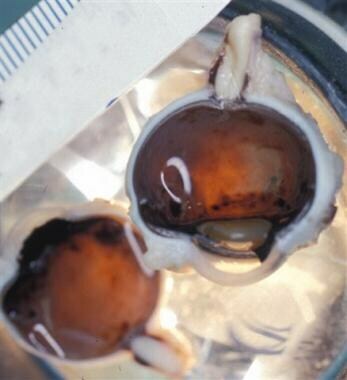 When hypoxia affects the brain generally, those cortical laminae which are most vulnerable may become necrotic and produce a laminar pattern of necrosis within the cortex called laminar necrosis (see the following images). Hypoxic change in the right parahippocampal gyrus in a 19-year-old male who was an amateur boxer and received a blow to the head, resulting in confusion followed by loss of consciousness. He was transported to a hospital where he underwent emergent evacuation of a large right subdural hemorrhage. He did not regain consciousness following the surgery, developed increasing intracranial pressure, and died on the third day after his injury.At autopsy, he had remnants of the acute subdural hemorrhage over the right cerebral convexity. There was right tentorial herniation. The right parahippocampal gyrus demonstrates hemorrhagic necrosis. 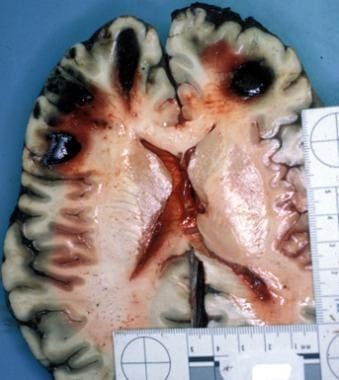 Laminar necrosis of medial portions of the right and left occipital cortex in a 35-year-old man who was cutting branches out of a tree when he fell 16 feet and landed on the top of his head with his arms outstretched. He was immediately unconscious and was hospitalized for 2 weeks with comminuted fractures of his right frontal, parietal, and temporal bones and with underlying fracture contusions of the brain. He was sent to a nursing facility where he remained deeply comatose and died 5 weeks later. 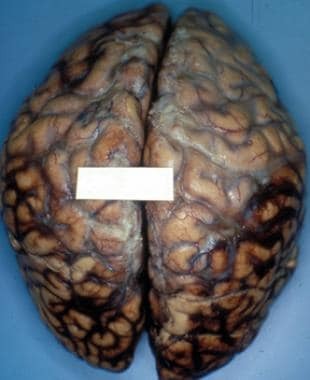 At autopsy, in addition to his resolving fracture contusions, he showed laminar necrosis involving the distributions of the both posterior cerebral arteries. This illustration shows slight cavitation and softening with pale brown discoloration of the medial aspects of the occipital cortex bilaterally. The distinction between accidental and inflicted head injury in children is a problem to many physicians who treat young children or who autopsy them. Because a person who injured a child may be unwilling to reveal the circumstances of the injury, physicians frequently encounter untrue histories and must try to differentiate accidental from nonaccidental injuries. Inflicted neurotrauma is a common cause of severe brain injury and death in infants and young children. [22, 23] Accidental injuries account for far fewer serious head injuries in young children than inflicted trauma. Accidental head injuries tend to create primarily focal contact injuries including scalp contusions and lacerations, skull fractures, focal subdural hemorrhages, or epidural hemorrhages. When greatly increased intracranial pressure results from one of these focal contact injuries, a poor outcome including death may follow. Death from a focal contact injury is very rare. Inflicted neurotrauma tends to have these features: diffuse brain injury with diffuse subdural bleeding, traumatic diffuse axonal injury, and brain swelling. To fully understand head injuries in young children requires an understanding of the developmental differences which exist in the brain and skull at these early ages. Such unique anatomic and developmental differences include a thin, pliable skull; large, heavy head; soft brain; large, shallow subarachnoid space; weak neck muscles; and a relatively flat skull base. Because of these unique features, children younger than 4-5 years are particularly vulnerable to inertial brain injury if significant rotational acceleration forces are applied to the head. 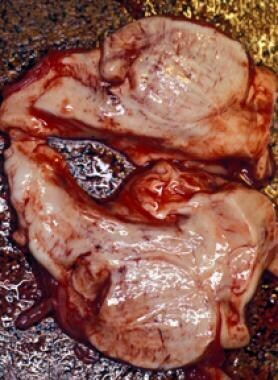 Subdural hemorrhage is evident in as many as 90% of cases of inflicted head injury in children at autopsy. 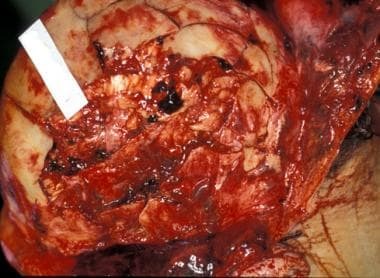 [25, 26] Although subdural hemorrhage may be so sparse that it may not be visible on computed tomography (CT) scans, it is evident at autopsy. Most frequently, the subdural hemorrhage is located over the cerebral convexities where it may be unilateral or, more commonly, bilateral, and there is a tendency for the subdural blood to extend into the posterior interhemispheric fissure. The subdural blood at autopsy may consist of a thin film of blood. Subarachnoid hemorrhage, usually sparse and in patches, occurs over the parasagittal cerebral convexities and also occurs in the great majority of cases in which there is subdural bleeding, as illustrated in the image below. [27, 28] If the cranial vault is removed by an autopsy assistant rather than the pathologist, these subtle findings may be missed or misinterpreted. Acute subdural blood over the cerebral convexities and patches of subarachnoid hemorrhage scattered over the cerebral convexities. Retinal hemorrhages are found in up to 85% of the cases of abusive head injuries in young children. Characteristic ophthalmologic findings in children with inflicted head injury include retinal hemorrhages involving all layers of the retina, extending to the periphery of the retina, retinal tears, and large numbers of retinal hemorrhages. [29, 30, 31] A finding that frequently accompanies retinal hemorrhage is hemorrhage within the optic nerve sheath, as demonstrated below. Sagittal section of an eye showing periorbital nerve sheath hemorrhage and numerous heavy retinal hemorrhages extending out to the ora serrata. Axonal tears are very difficult to see in young children because of the small size of the axonal processes. However, in the past decade, use of immunohistochemical staining with beta-amyloid precursor protein has been able to identify axonal lesions as early as 2 hours post injury in children. [33, 34] Blood vessels in young children are very elastic and do not tear readily even when adjacent axonal processes are torn, such that the streak and punctate hemorrhages grossly evident in many adult cases of traumatic diffuse axonal injury are very seldom found in young children. Inertial brain injury can result from either an impact to the head or impulse in which the body is moved and the head is then accelerated and decelerated. In adults, impulse injury is seen in events such as tackling a football player. In young children, the child may be picked up and shaken to cause impulse loading to the head. [35, 36] Based on the pathology alone, it is not possible to distinguish whether an abusive injury is due to impact or shaking. In both mechanisms, the pathology is identical. Lack of scalp injury does not necessarily imply lack of impact, because the scalp may not register all impacts. If there are focal injuries such as skull fracture, scalp bruises, or subgaleal hemorrhage, impact can be assumed, although shaking cannot be excluded. A rare lesion sometimes found in children younger than 1 year is the contusion tear. [14, 37] These are small cleftlike tears at the cortex-white matter junction or within the layers of the cortex. Contusion tears are manifestations of diffuse axonal injury and are usually accompanied by subarachnoid and subdural hemorrhages. Recognition of diffuse brain injury as a mechanism of inflicted head injury is valuable, because diffuse injuries become symptomatic immediately if there is a moderate to severe degree of traumatic diffuse axonal injury. Symptoms demonstrated by these severely injured children include an immediate decrease in the level of consciousness, either lethargy or unconsciousness; respiratory irregularity, difficulty, or apnea; and, frequently, seizures. Children who sustain repetitive episodes of mild injury gradually accumulate brain damage and may eventually acquire neurologic deficiencies. The exact timing of these injuries is not possible. Mild injuries not accompanied by loss of consciousness are frequently not brought to medical attention. Examination procedures, including external examination of the head, internal examination of the scalp, and examination of the skull, the brain, and the vertebral artery are briefly discussed below. It is absolutely essential that the head and brain be examined in a planned and consistently uniform manner so that injuries can be recognized and thoroughly documented. Examination of the brain usually follows a systematic examination of the face, scalp, and neck with documentation of any abnormalities. attention to findings about the face, scalp, and cranial cavity; and toxicology findings. The examination of the head begins with inspection of the external surfaces of the head, face, and neck. Areas of wet or dried blood should call attention to sites of possible underlying injury. To properly examine injuries, any hair surrounding the injury should be shaved. Diagrams of injuries are useful if the injuries are multiple or complex in appearance. The mastoid-to-mastoid incision to open the head at autopsy allows reflection of the scalp forward and backward as well as permits close inspection of the undersurface of the scalp. Injuries that were visible externally can be viewed more fully from the undersurface. Not all impacts to the head produce an external mark, ­although most impacts do create some subgaleal hemorrhage. In young children, a blow to the head with a broad padded surface can cause lethal injury but leave no injury evident on either side of the scalp. The location and size of any subgaleal hemorrhage should be noted, and tissue sections should be taken for microscopic examination if determining the age of these hemorrhages is an issue. Inspect the calvarium for any wound or fracture that might be present. In many head injuries, the periosteum lying over the calvarium is suffused with blood. Fractures are best demonstrated by removing the periosteum in the vicinity of fractures. The temporalis muscles should also be removed to adequately view the underlying bone. As the calvarium is opened, it is helpful to saw around areas of injury. When the calvarium is lifted off, the presence of any epidural or subdural blood should be noted, because such blood will be lost during manipulation and removal of the brain, and it is important to note even very small quan­tities of such blood. The "fit" of the brain should be assessed, as the brain sits inside the cranial cavity; fit is particularly significant in infant brains and may be the best indicator of marked swelling. After the brain is removed from the cranial cavity, the dura should be gently re­moved from the cranial fossa, such that fractures and other wounds can be thoroughly examined. The brain may be examined in either the fixed or unfixed state. Fixation of the brain is done by immersing the brain into a bucket of 10% buffered formaldehyde and allowing the brain to remain in the fixative for 2-3 weeks. Brains are fixed before examination if there is particular interest in a very detailed examination of the brain or if the brain is so damaged or softened that examination in the unfixed state would be very difficult or might further damage the brain through the handling required for examination. Examination of the brain begins with a description of the symmetry of the 2 cerebral hemispheres and continues with a description of the appearance of the gyral convolutions and sulci for findings such as size, distribution and development, and consistency. A detailed description of any abnormality would be provided. The state of the leptomeninges is described as to transparency and the presence of blood or exudates. The vessels at the base of the brain in the circle of Willis are examined and described for any abnormalities. The external appearance of the brainstem and cerebellum is noted and described. The examination of the brain continues by removing the brainstem and cerebellum and cutting the cerebral hemispheres into sections. The sections may be coronal sections, which are longitudinal sections across the cerebral convexities or horizontal sections from anterior to posterior portions of the cerebral hemispheres. Close inspection of these sections is carried out to discern and describe any abnormality. Generally, in the brain, abnormalities should be described both pathologically and anatomically; that is, the abnormality should be located within a detailed anatomic site. The size and symmetry of the ventricles should be described. The brainstem is next examined by making transverse sections through the brainstem and noting any abnormalities. Lastly, the cerebellum is cut into sagittal sections and any abnormalities noted and described. When the vertebral artery is injured by a blow to the face, head, or neck, a basilar subarachnoid hemorrhage can result from blood dissecting from the damaged artery into the basilar subarachnoid space. To investigate the possibility of such vertebral artery injury, once the chest and abdominal organs, neck organs, and brain have been removed, the body should be placed prone on the autopsy table with a block under the upper chest. A skin incision is made midline over the cervical spine and occipital scalp and extended down to the lower spine as necessary. The skin incision is extended down through the paraspinal muscles to expose the vertebral bodies, and the vertebral arteries are exposed by removing the transverse processes of the upper cervical vertebrae. The point at which the vertebral artery leaves C1 to enter the foramen magnum is a point at which injury most commonly occurs and should be meticulously dissected at that site. Most vertebral artery injuries are a dissection or separation of the lamina of the vessel wall, rather than a complete transection, but any injury to the vessel will be detected by exposing the vessel and following its entrance into the intracranial compartment. Traumatic brain injury is primarily a gross finding, but histology may be beneficial in certain cases. Aging of injury is best done by the microscopic examination of sections and evaluation of the associated inflammatory reaction to the injury. Wounds like brain contusions can be evaluated by such examination, and although useful over the first 2 weeks post injury, the precision of such aging is much less precise than in the early days of the injury. 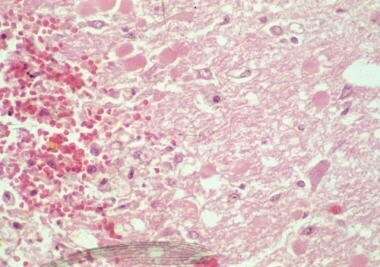 Axonal injury may be seen on hematoxylin and eosin (H&E) staining after the first 24 hours as enlargement or swelling of the damaged axons. The areas of axonal damage are usually associated with adjacent small hemorrhages, although these are usually lacking in young children. Axonal damage is microscopically evident after about 2 hours post injury by immunohistochemical procedures using beta-amyloid precursor protein immunostain. With this technique, all damaged axons readily stain and can be easily distinguished from normal axons. Because axons may be damaged by trauma or hypoxia-ischemic mechanisms, recognition of particular patterns of damaged axons is important for determination of how the axons might have been damaged. The traumatic pattern of damage to axons appears as individual axons or small numbers of axons scattered within the white matter. The hypoxic-ischemic or vascular pattern of axonal damage appears as clusters and large collections of axons often bordering a vessel. Head injuries are commonly injuries caused at the hands of assailants and thus frequently become homicides in which the pathologist will be expected to testify about in court. The distinction between injuries sustained by accident or by blows to the head is a common dilemma. The contrecoup pattern of brain contusion is helpful in that it is caused by a moving head striking the ground or surface. Most of these injuries are from accidental falls, but if an individual is struck and falls or is pushed or thrown to the ground, then such an injury becomes a homicide. Contrecoup patterns rarely, if ever, occur in children younger than 4 years, such that the common falls of young children do not show this pattern of a falling head. Child abuse is a common cause of head injury in infants and young children, and this must be distinguished from accidental falls or even from natural processes such as infection, coagulation defects, vitamin deficiencies, and genetic disorders. Kraus JF. Epidemiology of head injury. Cooper PR, ed. Head Injury. 3rd ed. Baltimore, Md: Lippincott Williams & Wilkins; 1993. 1-6. Graham DI, McIntosh TK, Maxwell WL, Nicoll JA. Recent advances in neurotrauma. J Neuropathol Exp Neurol. 2000 Aug. 59(8):641-51. [Medline]. Margulies SS, Thibault LE. An analytical model of traumatic diffuse brain injury. J Biomech Eng. 1989 Aug. 111(3):241-9. [Medline]. Ommaya, AK. Biomechanics of head injury: experimental aspects. Nahum AM, Melvin J, eds. The Biomechanics of Trauma. Norwalk, Conn: Appleton-Century-Croft; 1985. 245-69. Stalhammar D. Experimental models of head injury. Acta Neurochir Suppl (Wien). 1986. 36:33-46. [Medline]. Gennarelli TA, Thibault LE. Biomechanics of head injury. Wilkins RH, Rengachary SS, eds. Neurosurgery. New York, NY: McGraw Hill; 1985. Vol 2: 1531-36. McElhaney JH, Hopper RH Jr, Nightingale RW, Myers BS. Mechanisms of basilar skull fracture. 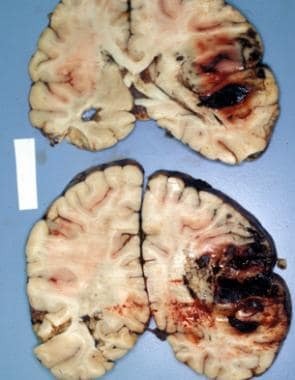 J Neurotrauma. 1995 Aug. 12(4):669-78. [Medline]. Voigt GE, Skold G. Ring fractures of the base of the skull. J Trauma. 1974 Jun. 14(6):494-505. [Medline]. Lindenberg R, Freytag E. The mechanism of cerebral contusions. A pathologic-anatomic study. Arch Pathol. 1960 Apr. 69:440-69. [Medline]. Dawson SL, Hirsch CS, Lucas FV, Sebek BA. The contrecoup phenomenon. Reappraisal of a classic problem. Hum Pathol. 1980 Mar. 11(2):155-66. [Medline]. Holbourn AHS. The mechanics of brain injuries. Br Med Bull. 1945. 3:147-9. Adams H, Mitchell DE, Graham DI, Doyle D. Diffuse brain damage of immediate impact type. Its relationship to 'primary brain-stem damage' in head injury. Brain. 1977 Sep. 100(3):489-502. [Medline]. Freytag E, Lindenberg R. Morphology of cortical contusions. AMA Arch Pathol. 1957 Jan. 63(1):23-42. [Medline]. Imajo T. Diffuse axonal injury: its mechanism in an assault case. Am J Forensic Med Pathol. 1996 Dec. 17(4):324-6. [Medline]. Pilz P, Strohecker J, Grobovschek M. Survival after traumatic ponto-medullary tear. J Neurol Neurosurg Psychiatry. 1982 May. 45(5):422-7. [Medline]. [Full Text]. Rivas JJ, Lobato RD, Sarabia R, Cordobés F, Cabrera A, Gomez P. Extradural hematoma: analysis of factors influencing the courses of 161 patients. Neurosurgery. 1988 Jul. 23(1):44-51. [Medline]. Jamieson KG, Yelland JD. Extradural hematoma. Report of 167 cases. J Neurosurg. 1968 Jul. 29(1):13-23. [Medline]. Lobato RD, Rivas JJ, Cordobes F, et al. Acute epidural hematoma: an analysis of factors influencing the outcome of patients undergoing surgery in coma. J Neurosurg. 1988 Jan. 68(1):48-57. [Medline]. Gennarelli TA, Thibault LE. Biomechanics of acute subdural hematoma. J Trauma. 1982 Aug. 22(8):680-6. [Medline]. McClelland CQ, Rekate H, Kaufman B, Persse L. Cerebral injury in child abuse: a changing profile. Childs Brain. 1980. 7(5):225-35. [Medline]. Billmire ME, Myers PA. Serious head injury in infants: accident or abuse?. Pediatrics. 1985 Feb. 75(2):340-2. [Medline]. Chadwick DL, Bertocci G, Castillo E, et al. Annual risk of death resulting from short falls among young children: less than 1 in 1 million. Pediatrics. 2008 Jun. 121(6):1213-24. [Medline]. Gilles EE, Nelson MD Jr. Cerebral complications of nonaccidental head injury in childhood. Pediatr Neurol. 1998 Aug. 19(2):119-28. [Medline]. Hymel KP, Rumack CM, Hay TC, Strain JD, Jenny C. Comparison of intracranial computed tomographic (CT) findings in pediatric abusive and accidental head trauma. Pediatr Radiol. 1997 Sep. 27(9):743-7. [Medline]. Case ME, Graham MA, Handy TC, Jentzen JM, Monteleone JA. Position paper on fatal abusive head injuries in infants and young children. Am J Forensic Med Pathol. 2001 Jun. 22(2):112-22. [Medline]. Dolinskas CA, Zimmerman RA, Bilaniuk LT. A sign of subarachnoid bleeding on cranial computed tomograms of pediatric head trauma patients. Radiology. 1978 Feb. 126(2):409-11. [Medline]. Kivlin JD. A 12-year ophthalmologic experience with the shaken baby syndrome at a regional children's hospital. Trans Am Ophthalmol Soc. 1999. 97:545-81. [Medline]. [Full Text]. Levin AV. The ocular findings in child abuse. Am Acad Ophthalmol. 1998. 14:1-13. Levin AV. Ophthalmology of shaken baby syndrome. Neurosurg Clin N Am. 2002 Apr. 13(2):201-11, vi. [Medline]. Case ME. Inflicted traumatic brain injury in infants and young children. 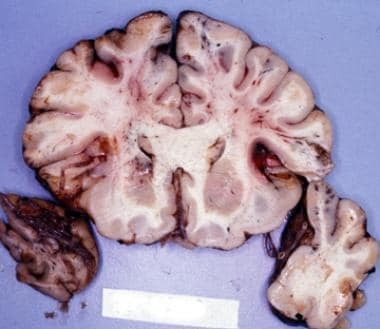 Brain Pathol. 2008 Oct. 18(4):571-82. [Medline]. Dolinak D, Reichard R. An overview of inflicted head injury in infants and young children, with a review of beta-amyloid precursor protein immunohistochemistry. Arch Pathol Lab Med. 2006 May. 130(5):712-7. [Medline]. Reichard RR, White CL 3rd, Hladik CL, Dolinak D. Beta-amyloid precursor protein staining in nonhomicidal pediatric medicolegal autopsies. J Neuropathol Exp Neurol. 2003 Mar. 62(3):237-47. [Medline]. Duhaime AC, Alario AJ, Lewander WJ, et al. Head injury in very young children: mechanisms, injury types, and ophthalmologic findings in 100 hospitalized patients younger than 2 years of age. Pediatrics. 1992 Aug. 90(2 Pt 1):179-85. [Medline]. Dias MS, Backstrom J, Falk M, Li V. Serial radiography in the infant shaken impact syndrome. Pediatr Neurosurg. 1998 Aug. 29(2):77-85. [Medline]. Munro D, Merritt HH. Surgical pathology of subdural hematoma. Based on a study of one hundred and five cases. Arch Neurol Psychiatry. 1936. 35:64-78. Adams JH, Doyle D, Graham DI, Lawrence AE, McLellan DR. Gliding contusions in nonmissile head injury in humans. Arch Pathol Lab Med. 1986 Jun. 110(6):485-8. [Medline]. Grcevic N. Topography and pathogenic mechanisms of lesions in "inner cerebral trauma". Rad Yug Acad Sci. 1982. 402:265-331. Lindenberg R, Freytag E. Morphology of brain lesions from blunt trauma in early infancy. Arch Pathol. 1969 Mar. 87(3):298-305. [Medline]. Kaushik R, Krisch IM, Schroeder DR, Flick R, Nemergut ME. Pediatric bicycle-related head injuries: a population-based study in a county without a helmet law. Inj Epidemiol. 2015 Dec. 2(1):16. [Medline]. Nilsson M, Eriksson J, Larsson B, Oden A, Johansson H, Lorentzon M. Fall risk assessment predicts fall-related injury, hip fracture, and head injury in older adults. J Am Geriatr Soc. 2016 Sep 30 [Epub ahead of print]. [Medline].